Tipper Container, Chip Container, Tipping Skip, Tipping Bin and Tip Skip | SalesBridges B.V.
Chip Containers are widely used by factories, warehouses, pallet dealers, carpenter, metal companies, garden centers, kitchen centers, but also in construction etc. 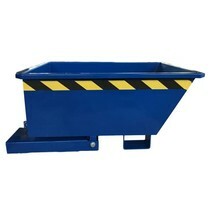 The Tipper Container is very easy to use and is suitable for a forklift. Manufactured to the most robust design and built to perform excellently with a long life span in the most demanding situations. Chip Containers are widely used by factories, warehouses, pallet dealers, carpenter, metal companies, garden centers, kitchen centers, but also in construction etc. 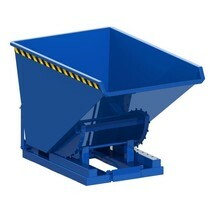 Everyone we can offer a suitable Tipping Skip for guaranteed the lowest price. There are several types of Tipping Bins available with or without wheels. The wheels are generally available in the polyamide, rubber or PU version. The containers are finished with powder coating in the standard color RAL5010. Other RAL colors are available upon request. Customized work is also possible on request.